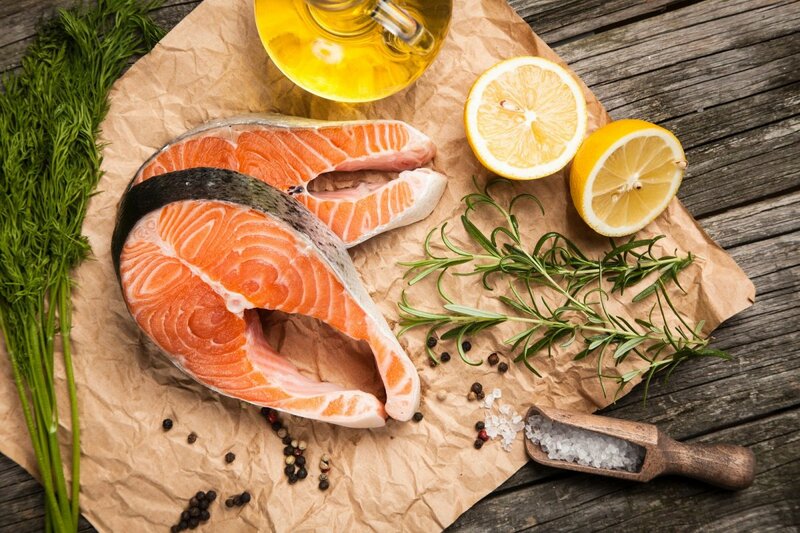 5 Easy Steps for the Best Fresh Salmon: Shop in the Know! Salmon is America’s favorite fish, making up about 13 percent of the total fish we consume. But while this richly flavored, brightly hued fish is certainly delicious, we’re not all on the same page when it comes to buying it. 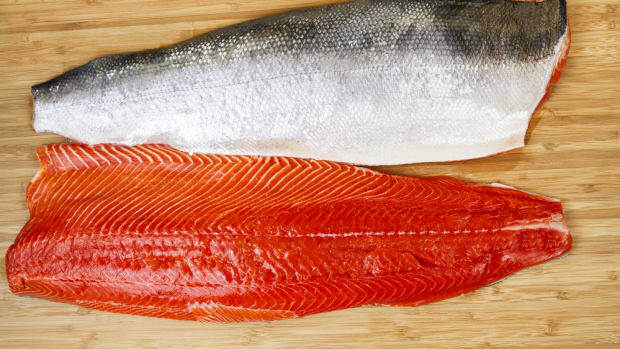 If you want your fresh salmon to be both tasty and sustainable, this guide is for you. 1. Choose wild-caught fresh salmon when you can. Salmon is a relatively sustainable fishery, particularly if you’re choosing troll-pole caught salmon. This technique involves fishing with a hook and line as opposed to a net, which is a more selective method. But while you can buy many kinds of troll-pole caught fish, like tuna, for example, salmon has the added benefit of being a sustainable wild fishery, given the ease with which we can keep track of salmon stocks. 2. Know your farmed salmon. Farmed salmon is given a processed, high-fat feed to produce larger fish, giving it a different nutritional profile to wild. Half a fillet of farmed salmon contains nearly 150 more calories than its wild counterpart, most of which come from fat, with 27 grams per fillet to wild salmon’s 13. Farmed fresh salmon also contains a whopping six times as much omega-6 fatty acid. While this still isn’t enough to be cause for concern, with a 1:4 omega 3 to 6 ratio, it&apos;s still not quite as good to the 1:3 ratio in wild. Wild salmon is higher in minerals like potassium, zinc, and iron than farmed salmon. 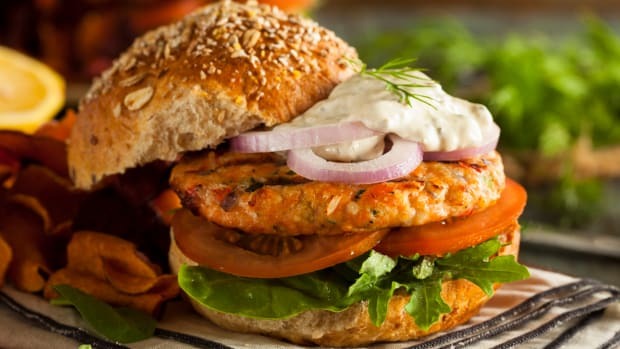 Aside from these nutritional differences, you may have already heard some unpleasant things about the farmed salmon industry, like the fact that farmed salmon has a higher concentration of contaminants like dangerous polychlorinated biphenyls (PCBs) than wild salmon, according to a 2004 study in Environmental Science & Technology. Another 2004 study in Science showed that, on average, PCB concentrations in farmed salmon were eight times higher than in wild salmon. 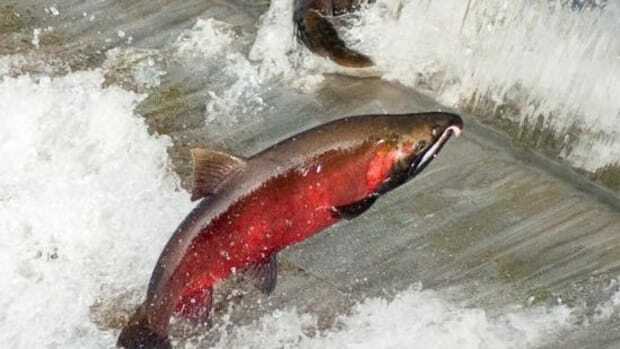 There’s also the matter of dyed farmed fish – wild salmon are naturally pink, due to their consumption of astaxanthin-rich krill and shrimp, but farm-raised salmon are naturally gray. Farmers determine how pink or red their salmon will be by feeding them supplemental “pigment pellets” containing astaxanthin. 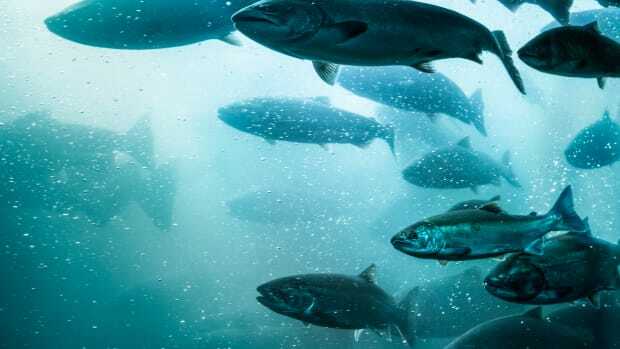 While wild salmon is the better option for healthy, sustainable fresh salmon, cheaper farmed salmon can be a viable alternative... if you do your research. “There are not a lot of them, but there are some farmed salmon products that do a good job,” says Ed Cassano, CEO of Pelagic Research Services and a former senior executive at the Monterey Bay Aquarium. 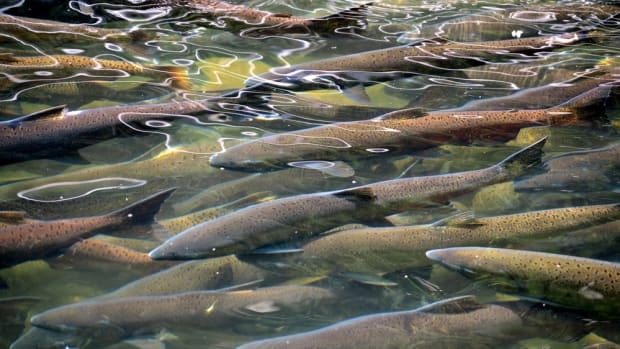 Several labels -- from a green rating from Monterey Bay Aquarium’s Seafood Watch or an Aquaculture Stewardship Council label, whose standards include a ban on prophylactic antibiotics, maximum levels of fish-based feed, and disclosure of any GMOs in the feed -- can indicate a good-quality farmed salmon. There are also a few stores that you can trust to make this selection for you, according to Cassano. Ryan Bigelow, Seafood Watch Program Engagement Manager at the Monterey Bay Aquarium, notes that while most wild fisheries on Seafood Watch are either yellow or green, most farmed products are still in the red category, meaning that they should be avoided. There are a few other good farmed salmon options as well – choices that have been ranked highly by the Monterey Bay Aquarium from Chile, Norway, and different parts of Canada -- that allow fresh salmon lovers to enjoy a healthy, sustainable product at a much lower price than wild. Being curious about your food is always a good idea, but especially when it comes to salmon. Ask your restaurateurs, supermarkets, and fishmongers about where your salmon is coming from and how it was fished. “I was just in San Diego, and a very nice bearded gentlemen spent five minutes describing my beer to me in very specific terms, but when I order the salmon, I just get, salmon, and there&apos;s no explanation of where it came from or why, or how it was caught,” says Bigelow. “We need to change that, we need to ask questions about our seafood, we need to care about it." So start a conversation! 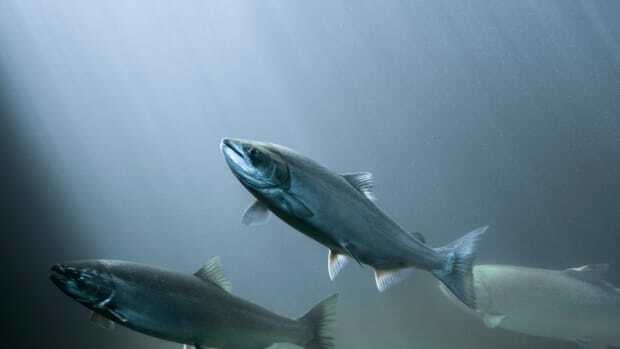 Bigelow suggests that if asking specific questions about where and how the salmon was caught seems uncomfortable, that you can simply start with, "Do you sell sustainable seafood?" 4. Use your eyes and nose. As with any fish, there are a few ways that you can tell if the fish you are buying is at its peak of freshness. Fresh salmon should show no signs of browning around the edges, and it should be nice and firm. The flesh of the salmon should be moist, which is a great indicator of freshness, but be sure that it’s not wet. If the fresh salmon is sold or displayed whole, its eyes should be clear. There should be no fishy smell to fresh salmon; it should smell like the ocean. King salmon is the most highly sought-after salmon, given its high oil and omega-3 content and rich, buttery flavor. It’s also the most expensive variety, but it’s well worth the higher price tag for a special occasion. Sockeye salmon is known for its rich red color and extra-firm texture. The best Sockeye salmon comes from the cold rivers of Alaska, where salmon have an extra long run to make and therefore gorge themselves for fuel, making their flesh fatty and full of flavor. Coho salmon, also known as Silver salmon, has a milder flavor than many other varieties, which makes it great for people who prefer a less fishy-tasting fish. But when in doubt, you can skip the salmon entirely and opt for arctic char. This member of the salmon family tastes quite a bit like the real thing, but unlike salmon, it is quite easy to farm it sustainably. 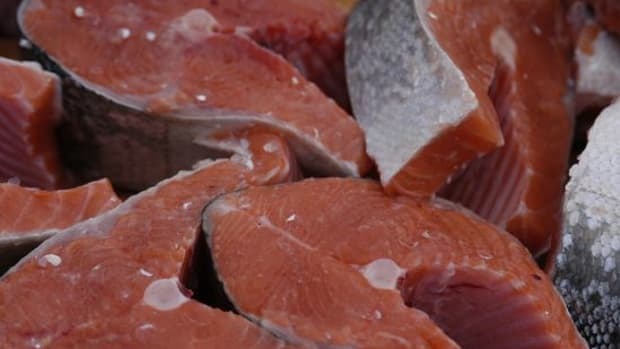 “In terms of its ability to be raised like a farm product, it&apos;s more like a trout, so you get a really good, fatty fish that is farmed in a pretty sustainable way,” explains Cassano. Arctic char has a similar nutritional profile to salmon, though it&apos;s a bit lower in omegas than its more famous cousin. As a less expensive (and equally delicious) alternative to salmon, however, serving arctic char recipes from time to time might make it easier to opt for more expensive wild salmon when you want to pull out all the stops. Our Tuna Addiction: Is Sustainable Tuna A White Whale?